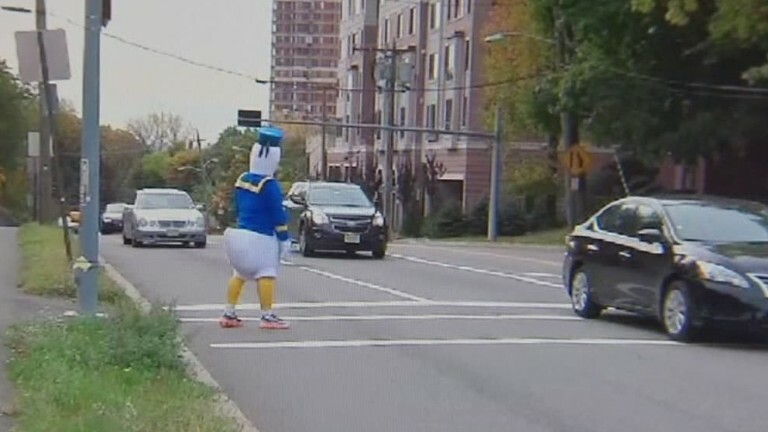 An undercover New Jersey police officer dressed up in a full-body Donald Duck costume to catch dozens of motorists on Halloween who failed to yield to a pedestrian attempting to cross the street. ABC 7 reports that the undercover operation was part of a decoy program recently developed to catch motorists who are guilty of that particular moving violation and usually are able to get away with it. According to the report, 40 pedestrians have been struck so far this year by motorists driving in the same area selected for this decoy program — River Road in Fort Lee at a crosswalk with yellow flashing lights. The 6’4″ undercover cop dressed as Donald Duck would step off of the street curb into the road in front of oncoming traffic in order to see which drivers would yield to him as a pedestrian. In most cases, “Donald Duck” would find himself hopping right back onto the sidewalk since many of the drivers refused to stop. Police One states that “Donald Duck” was frequently passed and even honked at whenever he attempted to cross the street. The motorists who passed the undercover cop dressed as Donald Duck without yielding were later directed to pull over by uniformed police officers in order to receive the tickets for their moving violations. In an interview with ABC 7, Karen Haigh (one of the motorists that received a ticket) expressed why she did not think it was very clear. Local police allowed ABC 7 to record footage from this decoy undercover operation, showing the officer dressed up as Donald Duck trying to cross the street as well as the police officers that were able to pull over the motorists that were later ticketed. Police Chief Keith Bendul spoke to ABC 7 about the undercover Donald Duck operation as well, explaining the progressive success of the decoy program overall in recent years. Chief Bendul continued by explaining that motorists need to yield for all pedestrians — even the costumed ones. The report further states that 130 drivers received a $230 ticket along with two demerit points on their license for not allowing “Donald Duck” to cross the street.